Entries closed at midnight on 30th April 2012. Ronell's bleaching was much more subtle than my card sample. 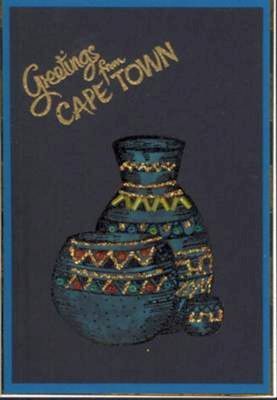 Did you use an Aqua Painter or Blender Pen for your card, Ronell? I think you would get a much more subtle effect that way and have more accuracy and control over what was bleached. I used a cotton bud to apply my bleach to my own flowers. This resulted in a larger and less defined area being bleached compared to Ronell's entry. So now you have two ways to use bleach on your card or scrapbook page images. 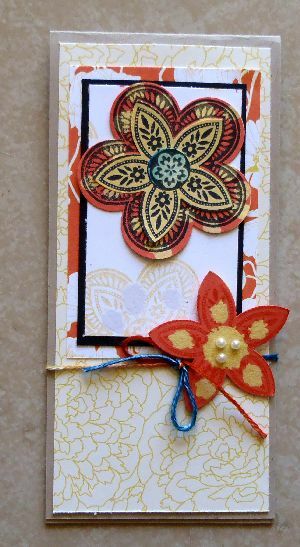 The cardstock I used was Stampin' Up's Pacific Point, So Saffron and Tangerine Tango (some of these colours are now retired, so do check out the colour refresh at Stampin' Up! by going to the catalogue and shopping link in the right hand column of this page) and there was Beyond the Garden designer series paper (NLA) on my card too. I dyed the Baker's Twine with the three required colours by sponging and dragging white twine through the three different coloured ink pads, a section at a time. My images were mounted on Whisper White and Basic Black cardstock from Stampin' Up! Finally I enhanced my Tangerine Tango with ordinary household bleach application, and with some pearls. See how the bleach turned the orange paper a shade of yellow? Congratulations again, Ronell, for winning the April 2012 Creative Challenge. I hope everyone reading will join in on some of the PaperCraftCentral Creative Challenges and stretch your paper crafting skills. And if you need a little more inspiration, here is a tutorial from SplitCoastStampers showing the bleach being used as a stamping medium. This technique does not hurt your stamp rubber if you clean the bleach off and condition your stamping rubber straight after use. 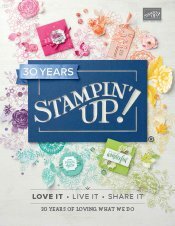 I use Stampin' Mist from Stampin' Up! for that. If you have any ideas for how to challenge fellow crafters, do let me know on the Contact Me page, and if you want to be notified about future challenges, do subscribe to my monthly newsletter, Paper Twists.